In the world where coming on time is of utmost importance, and leaving the office late due to work that you have to catch up with, having to work around technology problems is a big no-no. Technology is created to work for us, but often times we find ourselves frustrated and annoyed by the lack of ease while manipulating our touchscreen devices. For technology to work the way we want it to, it needs to constantly be improved and worked on. One such piece of technology is a mobile app called PDF to Word, a state of the art OCR conversion tool. What makes this app stand out compared to its competitors is the feature most important on a converter: its conversion engine! Its developer, Cometdocs, recently licensed one of the strongest conversion and OCR engines in order to make this beastly app. Since the app was re-introduced to the market in early May this year, it has been revamped with some incredibly innovative features. One of the most notable features introduced in its third update is the addition of integrated importing services. These services will allow you to import PDF files from app that would otherwise make it harder for you to convert. Why? Because iOS doesn’t have a file browsing system and you have to manually look for the files you want to find. 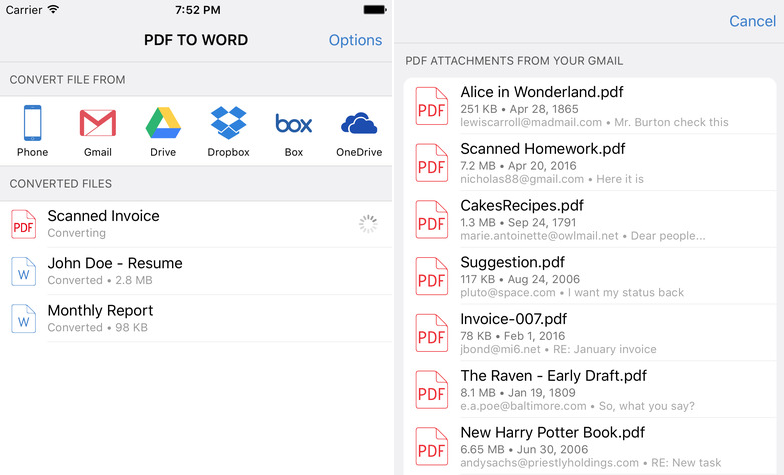 The integration of these services makes it so that you may open your Gmail and the app will automatically show you a list of all PDFs you have on that account. Simply by clicking on the PDF you want to convert it will be sent in queue. The app will take only several minutes to convert your file, but depending on how busy the servers are, how many conversions you have going on at the same time, as well as your own internet connection, it may take up to an hour. All the files that are being converted, as well as the already converted fill will show up on your main screen. By tapping on them you can see a preview of your file, and by clicking on the share button you can export it to a multitude of other apps. It is important to note that this app doesn’t let you edit the file within the app, but rather lets you have the freedom of choice when it comes down to reusing the file. Feel free to try out the app; it is completely free to download on both iOS and Android. Also make sure you rate it and leave a review for future readers and users to know what kind of an experience you had! We are looking forward to reading all your comments and reviews of PDF to Word.